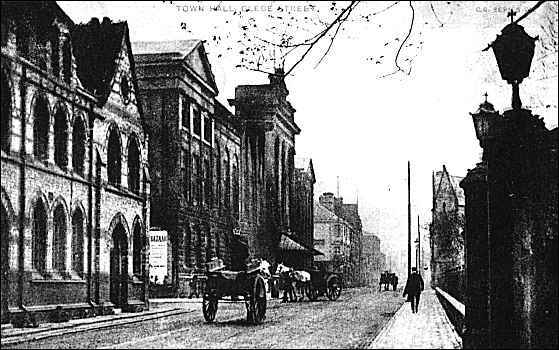 Taken from Glebe Street with Kingsway on the left, the Glebe Hotel is visible just beyond the Town Hall. Town Hall. Central block of 1834, by Henry Ward, the north wing added in 1842 and the south wing added some time after 1850. Ashlar faced, flat roofed. 2-storeyed, 5 bays, the outer and central sections of 3 and 5 bays, advanced. Central section forms entrance portico with 3 archways to ground floor beneath Ionic columns carrying deep entablature and elevated pediment. Windows with shouldered architraves set behind these columns. Outer bays also pedimented, with Ionic pilasters to first floor, segmentally arched windows below. These sections are linked by flanking blocks of 5 bays, with segmentally arched windows. Rusticated basement storey throughout, with ashlar above. Balustrade runs along front, over cellar area. Return elevation to Kingsway of 3 bays with heavy broken entablature to central doorway which has architrave with Ionic shafts banded with rusticated blocks. One bay recessed beyond contains archway to rear yard, with heavy volute and swags over, and open peristyle with Ionic columns above. Adjoining to the SW, Kings Hall and Jubilee Hall were added in 1911, by T.Wallis and J.A.Bowden. 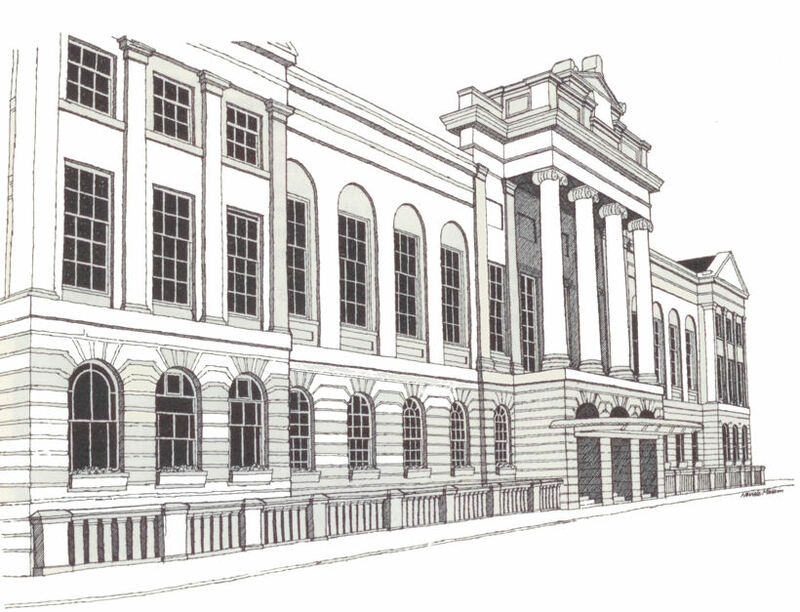 2 storeys, 9 principal bays, the central 3 contained beneath a pediment, and advanced slightly. Central door is in heavy surround beneath Ionic columns flanked by full height archways. Outer doorways enriched with heavy moulded architrave and pediment. Detailing throughout is Mannerist in inspiration: exaggerated detailing to doorways with heavy volutes and swags, concave moulding around windows, broken pediments. Long range links this entrance block with the Town Hall, with oculi over doorways. (The Victoria History of the Counties of England: R.B. Pugh: Staffordshire: Oxford: 1963-). 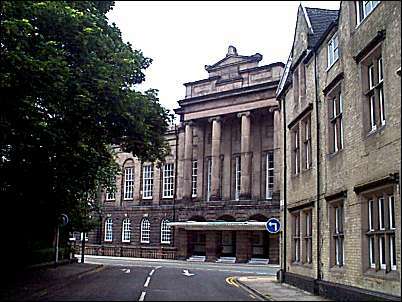 Stoke Town Hall is the largest of the Potteries' old municipal buildings. It was designed in the classical style by Henry Ward and construction began in 1834, though the south wing still remained unfinished in 1850. The nineteen-bay frontage is faced entirely in ashlars (large square-cut thin slabs of stone used for facing walls [Latin axis board]); its central feature incorporates a giant upper portico of unfluted Ionic columns, with a heavy attic piled above. The middle portion, originally a market hall, was rebuilt in 1888 to house the Council Chamber, Mayor's Parlour and municipal offices of the Borough. "Coming to the municipal buildings of the town, the first to attract our attention will be the Town Hall, which is a structure worthy of the town and its Corporation. It consists of a centre and two wings, and includes a large hall, used as an assembly room and theatre, enlarged in 1880 so as to hold 1,400 persons. At the same time, a council chamber, with Mayor's parlour and municipal offices were constructed on the ground floor. 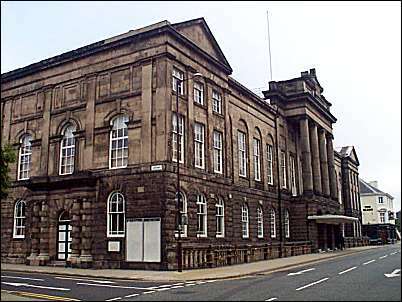 In the south are the country court offices; while the north wing is assigned to the county constabulary, and contains also a large room for the weekly sittings of the stipendiary magistrates' court and the Keary Law Library." 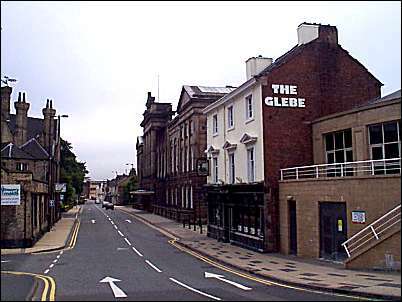 "The intended market in Glebe Street, was patronised by several of the more wealthy inhabitants, who became shareholders in the undertaking; and erected the stone basement of a large Town-house and Offices, intended to be connected with a new market place, in which, and the purchase of the land, more than £3000 was expended; but this building at present remains unfinished and id likely to do so, until public spirit shall concentrate itself, in rendering Stoke the real head of the Borough, and the other Town lay aside their rivalry, and combine to overlook their particular interests, for the sake of advancing its supremacy." 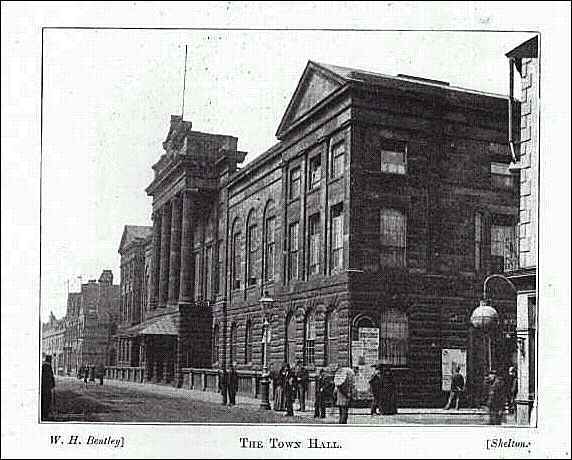 "The new Town-hall of Stoke, mentioned here as likely to remain unfinished, was, in the autumn of 1841, begun to be re-advanced by the proprietors, and the main part of the building, according to the beautiful design, has been since completed."